Are you planning a vacation but finding it difficult to keep your information organized? Developing a vacation itinerary takes research and careful planning. Do your sticky notes mysteriously disappear? Prevent the hassle of digging through a pile of notes with our downloadable vacation itinerary planner. Our vacation planner organizes and saves your vacation plans as you develop them, saving you valuable time and energy. Download the vacation itinerary planner for free here today! This template is fully customizable to suit your needs and is free to download here. This planner has adjustable columns and rows to allow room for all your information. You can format colors and fonts for individual or multiple cells with contrasting colors for ease of reading or highlight pertinent information by filling the cell with your choice of color. 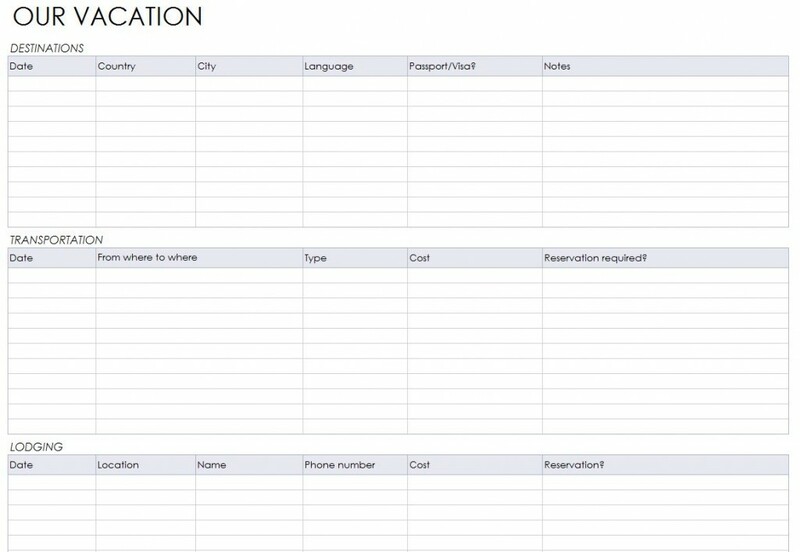 This user-friendly template provides you with the tools you need to organize and plan your vacation without forgetting important information. Record contact information, packing lists, routes, motels and final destination in this template. Other sections allow you to track fuel expenses, meals and your allotted budget. The copy and paste feature allows you to duplicate information from one cell to another. Use your mouse to adjust the size of columns and rows. Select your cell, and then click on the paint bucket icon to choose a color to fill the cell with color. You can select multiple cells at a time to fill with color or fill each individually. Left click and hold on the first cell and move your pointer to the last cell you want to fill, then choose your color. Customize the font face by selecting the appropriate font from the drop down list located on the toolbar at the top of the window. Choose the size for your font by clicking the drop down menu next to the font face choices. Save the Vacation Itinerary Planner on your computer for future use. Print multiple copies of the Vacation Itinerary Planner to hand out to your passengers by clicking “file” the “print” from the menu that appears. Download our free Vacation Itinerary Planner today; start your vacation tomorrow.